* Please note: prices listed are gundog prices, limited AKC registration is included at this price. Please call to discuss possible full registration and price with breeding rights. * Please note: prices listed do not include MN state sales tax of 0.07375. All transactions, including cash transactions made in the state are subject to this tax. * No Sales tax on dogs shipped out of State via air. "Ole" is a near carbon copy of our stud dog Razor. He allows us to double down hard on the traits we like in Trinity. This is a repeat of a very successful breeding. Ole has been trained by Troy Benson at North Star Kennels, and earned his Master Pointing title with Troy. Ole is owned by a local family here in our area. He is a straight - hocked dog, with a deep chest who moves very well. He is a staunch pointing dog with a very natural soft mouth... delivering to hand before he was force trained. His owner describes Ole as a beast in the field, yet calm in the house with their two year old daughter... and a non-barker. SAUK RIVER TRINITY is a daughter of our own "Jazz" and Sauk River Deke". She is a grand-daughter of the great GMPR MHR Sauk River Featherstorm. Trinity pointed her first bird and every bird since. She has an excellent on/off switch. She is calm indoors and while kenneled. Trinity moves well, has a soft mouth, and trails birds using ground scent very well. Pups from Trinity and Ole have a zero percent chance of hereditary EIC. Pups from Trinity and Ole have a zero percent chance of inheriting CNM. Blacks / Yellows Due April 12 2019 ... ready to go to new homes June, 2019. K I N G is one of the all time best instinctive pointing labs I have trained. a Gorgeous mid sized dog at 70 lbs...KING is an excellent athlete. He has outstanding drive, Yet is very biddable. King is a house dog in St. Paul, and an outstanding pheasant hunter. You can see a video of King in our upland field when he was here earlier in the year. The JAKE x MAGIC pups have in large part, made us the kennel we are today. Hips: OFA GOOD. Elbows: OFA NORMAL. CERF CLEAR 2018. CNM CLEAR. PRA/ Prcd CLEAR. EIC CARRIER. Is a beautiful, blocky 60 lb black female with a ton of pointing instinct. Jazz carries everything around in her calm / quiet mouth..
She has a quiet intensity and is a sky scanner hard-wired for birds. Playful, regal, patient, she is a fun dog with high character. J a z z is one of the all time great dames here at Sauk River Retrievers. We have kept several of her pups and have enjoyed training her pups for our clients. Pups from KING and Aspen have a zero percent chance of hereditary EIC. Pups from KING and Aspen have a zero percent chance of inheriting CNM. Pups from KING and Aspen have a zero percent chance of inheriting PRA, HNPK, or either form of dwarfism. Yellows Due May 31, 2019 ... ready to go to new homes July, 2019. TEKA is a 55 pound performer... who is very laid back. She is calm quiet, Easy to be with. When birds are involved she has a high working energy with an EXCELLENT nose... and a strong pointing instinct. I have trained several of Teka's pups. They have been outstanding. This pairing of Teka and King has me excited. Call, or e-mail to reserve. I am particularly looking forward to a chance to train pups from this litter in the months ahead. Pups from KING and Teka have a zero percent chance of presenting with hereditary EIC. Pups from KING and Teka have a zero percent chance of inheriting CNM. Pups from KING and Teka have a zero percent chance of inheriting PRA, HNPK, or either form of dwarfism. *Our prices are "gundog" prices. We have intentionally set prices below market value as a service to our customers. Dogs sold at this price are sold with a limited AKC registration as "non-breeding dogs". If you are interested in breeding your dog, please inquire about price. Thank you. *Litters sired by a stud outside of our kennel will carry a price that reflects the stud fee and travel involved. MN state sales tax of 0.07375 applies to all pups and started dogs. No Sales tax charged on dogs shipped out of State via airline. All transactions made in the state are subject to the sales tax. Our 2018 prices should again allow most hunters to look at obtaining a pointing labrador from the Sauk River program. During 2008 Sauk River Retrievers began genetic tests to screen for EIC, and PRA (Progressive Retinal Atrophy) in our foundation dogs. Optigen has a genetic test for the mutant prcd gene which causes progressive retinal atrophy (PRA) in Labrador Retrievers.. 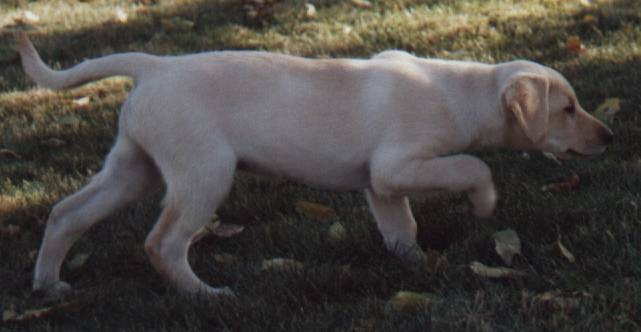 The prdc gene is the only known mode of inheritance for PRA in labrador retrievers. The optigen test complements annual CERF exams. The optigen test will pick up carrier dogs that CERF tests can not detect. The optigen prcd test will also find definitive results at a much earlier age than would a CERF exam where even affected dogs may not show visible symptoms of PRA til after they reach beeding age. Sauk River Retrievers is committed to our new puppy owners and providing the most valuable information that we can reasonably provide. The tests are not cheap and we can't perform all genetic tests. However, we are monitoring and choosing tests which make sense for our owners. Sauk River Retrievers will not be producing any litters in 2018 / 19 with a chance of EIC affected dogs. 2018 again saw nearly all Sauk River Pups spoken for prior to the whelp. We know that many of you waited up to a year for your pup. Jane and I appreciate your trust in what we are doing. We know that it will be worth the wait. We value your feedback. We have spent time in the field with new dogs nearly every day this year this year. There are some exciting new options coming up. Jane and I will continue to evaluate and select options for obtaining a Sauk River Pointing Lab in 2018-19. To reserve a Sauk River Pointing Lab puppy in 2018 / 2019... Send a $200 deposit. The balance is due when your pup goes home. We can safely ship pups all over the world and are glad to make arrangements for you. Call or e-mail David or Jane for details. If pre-whelp deposits have filled, ask about getting on the waiting list for extra pups. The Sauk River Breeding program: A Service to Hunters. 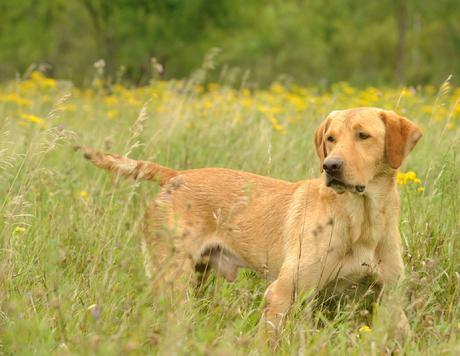 Sauk River Retrievers is committed to providing Premier Gundogs at a price that the general public can afford. Price doesn't determine quality. Titles don't determine quality. Genes and rearing practices determine quality. Selecting quality traits is our #1 service to our new owners. Anyone can count GMPR's and FC's in a pedigree. We make every effort to stay true to finding the dogs with the traits that hunters value. Dogs that people will be successful with. That means we buy and evaluate a lot of dogs each year. We also see dogs from all over the country. in our training program. By working with dogs from breeding programs throughout the country, we certainly have an increased ability to evaluate what is really good in the pointing lab world. That's what the Sauk River program is about. Selecting the best genetics in the PL world. You get what you breed for, not what you pay for. We aren't afraid to purchase dogs with no titles, or breed to studs with lower titles. If their traits are better...we want that dog in our program. Sauk River Retrievers is out to provide a service to our new owners. 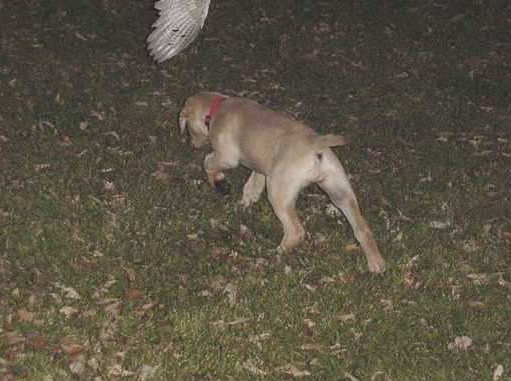 That service is to sort through and select the best possible set of traits for an outstanding pointing retriever. Sauk River prices may not be as high as some. Rest assured...Your Sauk River Labrador is bred to be a premier gundog. The Sauk River Rearing / socialization Program: A good thing made better. As a person who buys many pups each year to evaluate,...I am less concerned about my pick in the litter than in how the pups are reared and socilaized. Jane is able to spend a great deal of time with our pups...getting them used to positive touch and being handled....spotting any dominance / submissive issues and regrouping pups accordingly. Pups are exposed to various people, vehicles, obstacles, surfaces, noises...and of course birds. Jane has become very good at what she does. She is allowing owners to experience an even better start with their young Sauk River pup. I trust Jane to choose all Sauk River pups right now. You can trust her socialization / early start program for your upcoming puppy. As 2019 arrives... We remain proud of our planned breedings. Jane and I have worked to keep prices within reach of the majority of hunters. 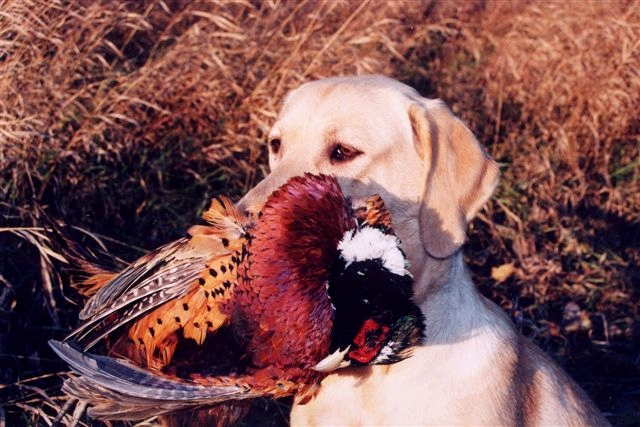 Our pricing is a committment to the average hunter who wants to access the best Pointing lab breedings in the nation. If you are looking for breeding stock, or have plans to breed your dog, please talk with us about your plans. We are excited to have some of our pups in other breeding programs. but we will be selective. Sauk River obtains OFA and CERF certification or prelims on parents. Pups have shots, anti-coccida, anti giardia meds, Superdog stimulation from days 3-16, full socialization, dews removed. We back our pups with the SAUK RIVER GUARANTEE. Most often, our litters are sold by deposit before the dogs are bred. * Your deposit is your comitment. It is important that you are sure. * Your deposit of $200 will be cashed and deposited to keep your records current. * You must choose to deposit on either a male or female. You may switch gender, but only behind other depositors on the list. * The deposit counts toward the purchase price of the pup. * If a pup of the gender you deposited on is not produced... Your deposit is refunded or you can switch it to another litter. * The First depositors on male and female may choose their own pup. I will choose for everyone else based upon traits desired by the depositor. I match pups in the order of deposit. Please send a note with your deposit. List the gender you chose. List traits in the order of importance. * Please keep in mind the order of pick has little to do with how great your pup is going to turn out. Much more important is the time you spend with it after you pick it up and of course the single most important factor is the breeding. We always say if you want a great dog forget color and pick order and just look at the traits the parents are bringing into the breeding.